Are reservations required? Cancellation Policy. Does Groome accepted card or cash? Are the shuttles ADA accessible? Will Groome provide a child seat? Do you provide on-site parking? We offer free, long term parking at the Northern Colorado Regional Airport. Do you offer residential pickups? Yes, you may reserve home pickup or drop off online or over the phone by calling (970) 226-5533. Home Pickup customers are given an hour window of possible pickup times and the evening before we calculate the most efficient routing to serve all our customers, then call each passenger to confirm a 5 minute pickup window for your trip the next day. What is Shared Ride and how does it work? The Groome Transportation Loveland Shared Ride Airport Shuttle service provides a low cost, environmentally friendly transportation service between Denver International Airport and Northern Colorado. In a Groome shared ride, you share the vehicle with other travelers while also sharing the overall cost of the service. Groome shared ride helps the environment by eliminating the need for travelers to drive to DIA or get a a ride with a friend or family member. Groome Shared Ride pickups are planned in detail every day. Late each day we calculate the most efficient routing to ensure home and business pickups are convenient and effective. After we have determined the most efficient routing we call each passenger and give a 5 minute pickup window for the next day. To ensure availability, we recommend at least 24 hours notice when seeking a reservation. We will do our best to accommodate same day reservations, but service cannot be guaranteed. Make your reservations online or by calling 970-226-5533, to avoid potential delays at your time of travel. Please call the reservation line as soon as you know you are in need of a ride and our agents will help get you on the next available shuttle. Hope to see you soon! Does Groome Transportation Loveland hold shuttles if passengers are running late? We don’t hold our shuttles. Because we are a shared ride service, it is important for us to adhere as closely as possible to our published departure times in order to respect the time of all of our customers but also to meet the logistical demands of our service. Once our drivers have pulled away from the curb at DIA, they are obligated to follow safe driving practices and will not stop to board late passengers. The exception to our no-hold practice is our 1:10am sweeper run. As it is the last run of the evening, we will hold it for up to 10 minutes if a scheduled passenger has not showed up by the 01:10 departure time. Does Groome Transportation Loveland offer a Senior Discount? Yes! For our passengers aged 65+ we offer a senior discount. Does Groome Transportation Loveland have a Frequent Rider/Loyalty Program? We do! From your very first ride with Groome, you accrue points for each ride you take with us. Once you reach a certain amount of points, you are eligible for one, free, one-way ride to or from DIA. You must call our reservations line to redeem your points- 970-226-5533. Does Groome Transportation Loveland have a refund policy? To cancel a reservation and receive a full refund, passengers must call by 11:59pm the day before their travel date. Same day reservations are non-refundable. Are the shuttles handicap accessible? Groome Transportation Loveland provides reserved seats for persons with ambulatory disabilities and specially designed vans with drive-on ramps for persons who use a wheelchair. Call our reservation line at 970-226-5533 for assistance in making reservations for accessible travel. Please alert your representative when booking reservations if you will be traveling with a service dog so we may reserve a seat at no additional charge for the service dog. What happens if I miss my shuttle? We know that traveling can be stressful, and there are many variables outside of your control when you are traveling by air. If your flight is delayed or your baggage gets held up, we will take good care of you by automatically moving your reservation to the next available shuttle. If you are going to be significantly delayed, please contact us at 970-226-5533 and let us know of your new expected arrival time. 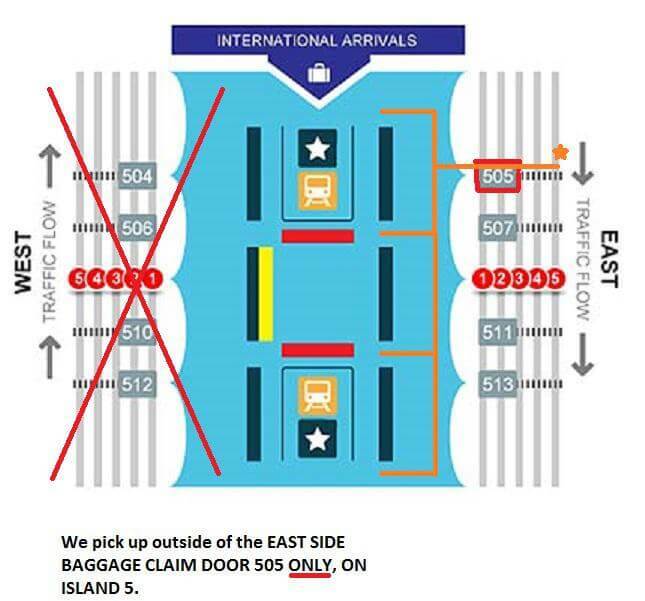 At the Denver International Airport passengers should proceed to East side of the Main Terminal, Outside DOOR 507, take the crosswalk to ISLAND 5, turn to the Right under the SPECIAL PERMIT sign to meet their driver. We ask that passengers arrive 10-15 minutes prior to departure for all locations. What is the check-in policy? We request all passengers check in at least 15 minutes prior to your departure time. How do I make an airport shuttle reservation? The easiest and most convenient way to make a reservation is to use our online reservation system. To make a reservation online, go to your local Groome Transportation webpage and click “Book Now” to get started. You can also call your local Groome Transportation office to make your reservation. How early should I arrive for my reservation? To maintain an on-time schedule, we kindly request all passengers be ready at their pickup location at least 15 minutes prior to departure. If you’ve missed your scheduled shuttle please call our office at (970) 226-5533 as soon as possible and we will rebook you on the next available departure. To ensure availability, we strongly encourage reservations. We will do our very best to accommodate customers who do not provide advance notice, but service cannot be guaranteed. You must cancel or change your reservation by 11:59pm the day before your travel date. Refunds will not be issued to customers calling in or cancelling after 11:59pm the day before your travel date. Same day reservations are non-refundable. Do you accept credit card and cash payments? Groome Transportation requires a credit card for any advance reservations made on the phone and online, we gladly accept all major credit cards. Each passenger may bring 2 suitcases and one carry-on. Additional baggage fees apply for oversized items such as skis, snow boards, golf clubs, and bikes. We do require bicycles to be transported in a bike box for their protection. * A standard size bag is to be defined as: Any bag or fully enclosed box with a Maximum Size of 62 inches and a maximum weight of 50 lbs. Example: 10"+20"+32: = 62"
**A hand carry bag is to be defined as: any small hand held item that can be comfortably and safely held in the passenger's lap or can be safely stored on the floor between the passengers feet without inconveniencing any passenger seated next to, in front of, or behind them. Groome Transportation Fort Collins provides reserved seats for persons with ambulatory disabilities and specially designed vans with drive-on ramps for persons who use a wheelchair. Call our reservation line at 970-226-5533 for assistance in making reservations for accessible travel. Please alert your representative when booking reservations if you will be traveling with a service dog so we may reserve a seat at no additional charge for the service dog. How old must I be to travel alone? Unaccompanied Minors, defined as passengers aged 15 to 17, may ride alone but a parent or guardian must submit an Unaccompanied Minor form before departure to ensure travel arrangements. Passengers aged 14 and under must travel with a parent or guardian. Groome Transportation follows all state laws regarding child restraint guidelines. In Colorado, the law requires that children under 8 years old must be restrained in the appropriate child restraint system. We aren't able to provide car seats or booster seats and require all passengers to provide them for their children. Please note: We are unable to hold any child restraint seats in our office. Please Note: The mifold Booster Seat is not approved by the Insurance Institute for Highway Safety (IIHS). We do allow pets to travel on shuttles. In order to avoid discomfort of any passengers, pets must be kept in a small airline-approved carrier. They must be clean, quiet and accustomed to travel. If you are traveling with a service dog please alert Groome Transportation ahead of your travel date(s) so we may reserve a seat at no additional charge for the service dog. What if I leave something on a shuttle? Groome Transportation is not responsible for any lost or damaged items, however, if you have left something behind please call your local office and we will do our best to reunite you with your belongings. Groome Transportation shall not be responsible for any lost or damaged luggage or any of the contents of customers luggage, to include, but not limited to, personal electronic items such as ipads, laptop computers, etc. Do you provide group transportation? Groome Transportation has a late-model fleet of vans to meet your group travel needs. Call your local Groome Transportation office to inquire about availability! Do you offer corporate or government accounts? If your organization’s associates travel regularly or you have clients, guests or prospective employees that travel to or from your office, a corporate/government account offers many advantages to your organization. Groome provides customized invoices or vouchers to your organization. Any service can be used at any scheduled time. Reservation can be made up to two hours prior to the trip time. Your reservations can be made by you, your guest, or by us. There are no taxes or handling fees. Groome eliminates the need to reimburse your associate or guest. Direct convenient monthly invoicing in each month you have riders. Services available 24/7, year-round. Schedules to meet any flight plan. Complimentary parking available at most offices for your convenience. Sharing a ride is less expensive and greener than driving alone. Enjoy curbside drop-off and pickup at your destination.